PRC announced also the list of topnotchers and here the top 10 of the September 2014 Naval Architect & Marine Engineer Licensure Examination who garnered the ten (10) highest places to the said board exam can now be viewed. Most of the topnotchers are came from NAMEI POLYTECHNIC INSTITUTE then followed by MARINERS POLYTECHNIC COLLEGE FOUNDATION-BARAS & UNIVERSITY OF CEBU. 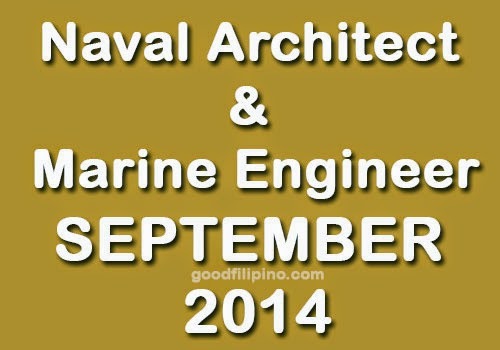 Comments or suggestions about "September 2014 Top 10 Passers of Naval Architect & Marine Engineer Board Exam" is important to us, you may share it by using the comment box below.